The problem with Summer is that everything grows so quickly. The lawns need constant attention, not so much for looks as to enable free passage and a clear vision of any resting snakes. The weeds in the vegetable beds aren’t dormant either. As quickly as the vegetables grow so do the weeds. The humidity and heat make working outdoors unpleasant and worse is the need to wear long pants and sleeves to protect against the sun. The hat to shade your face also keeps in the bodily heat. It’s for all these reasons that little in the way of capital works gets underway. Capital works include re-trellising the vineyard, a new front boundary fence, a bedroom that needs painting etc. Well at least you could say after a busy Autumn, Winter and Spring maybe it’s time to take some rest and recreation and read a book or three in the heat of the day. Well, if the weeds grow well so do the salad ingredients. A salad we are enjoying at the moment reflects the Summer. Starting with onion halves thinly sliced and sprinkled with vinegar (red, white or apple cider), scrunched with your hand to bruise the onion and mixed in the vinegar. The tomatoes sliced and then the slices quartered not too thin and not too thick. Aim at some chunkiness but don’t overdo it. Then the cucumber, small Lebanese less than 25 mm in diameter with immature seeds sliced into 4-5 mm thick rounds. For larger cucumbers halve or quarter length wise first. If you have carrots cut lengthwise into quarters or smaller, then slice into little chunks. The aim is to get raisin sized pieces that won’t feel too heavy in the mouth. The same process with young immature raw zucchini and capsicum can be followed if you have them. Avocado can be added as well for some softness. A good sprinkling of chopped or crumbled feta. Finally a couple of boiled eggs also chopped. Mix it all up and add some olive oil or any dressing you like. The chunkiness of the salad truly reflects Summer. 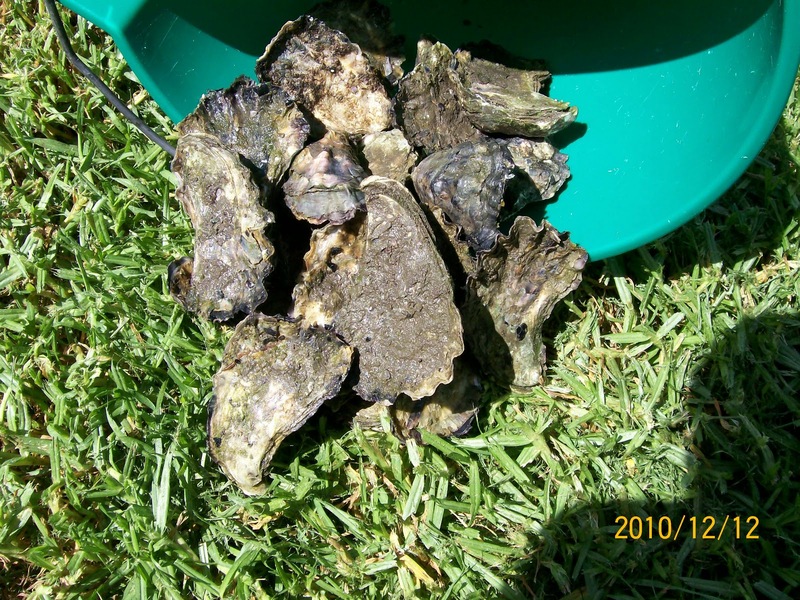 About this time of year the oysters are beginning to come into their best. In our area the best time is from Christmas to Easter. Collection for us involves an hour’s round trip and to be economical we take the dogs to the beach for an important dose of salt water and some exercise. The oysters are collected on the way back. Not too many just four dozen enough for two nights. The oyster farmer and his wife have become friends over time. We bring along some surplus vegetables, cheese or wine as a friendly gesture. Later, when opening the oysters somehow the four dozen has grown considerably. I suppose they either breed in bucket on the way home or the oyster people have lost count. Either way it is a generous gesture on their part and we are loyal customers. There are two recipes we use which produce outstanding results. They differ significantly. One uses olive oil and salt while the other uses nothing but the salt and the lemon juice, best called Moroccan Lemons. Use as many lemons as you want. Slice the lemons into quarters but leave the quarters attached. Put a table spoon of salt into the sliced lemon and stuff into the jar. Pack tightly and be generous with the salt. When the jar is fully packed, top up with lemon juice from spare lemons. Seal and leave for at least a month. They keep forever. Once the jar is open keep it in the refrigerator. A quarter or two goes nicely with all sorts of dishes. They are so tasty they even work with scrambled eggs. 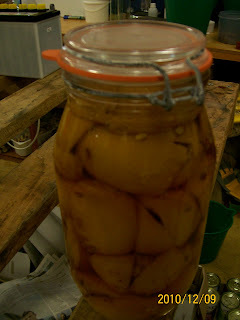 Salt the lemon slices and pack into one litre jars with the chillies and garlic mixed throughout. Heat the oil in a saucepan until hot (but not hot enough to break the glass jars then top up jars. After making bread for going on 25 years it may surprise everyone that we just might be getting the hang of it. We both noted this week that we have had several consecutive successes ie the dough has risen well, the centre hasn’t dropped as it sometimes does and the loaf cooked nicely throughout. It seems after many years of mucking about with varying recipes, we have hit upon the few important things. Well at least the few important things that work for our method. The basic ingredients have stayed the same as the simple recipe in the bread making machine’s book. What has always beaten us is that our coarsely ground wholemeal flour behaves differently with differing results. The changes that have worked for us are that there is only one rising. It is ready to bake when it reaches a certain height up the tin. This height has been ascertained by trial and error. Too high and the loaf slumps, too low and the bread is heavy. The second key item is more water to make a stickier mix. It works. The substitution of milk for water also works well and appears to give a better rise. Finally, a longer cooking time finishes the loaf nicely. We have no plans to go commercial but at least we make a reliable loaf for ourselves with more successes than failures. Nearly 20 years ago we acquired a peahen. It wasn’t all that long afterward a mature peacock arrived seeking love and companionship. There was some breeding in the early years but disease, foxes and rehousing kept the numbers down. The biggest issue was at breeding time ie September through to April two males find it difficult to co-exist. Endless chases around the house and paddock. The eldest peacock ‘Big’ was a bit of a gentleman and treated his young son with some kindness. Unfortunately ‘Young’ left for better pastures. His replacement was soon named ‘Head‘. He was un-relentless in the pursuit of ‘Big’. ‘Big’s’ advanced age and arthritis led to his demise one night. A very sad event after nearly 20 years of his presence and friendly shared breakfasts where he would take titbits from your hand. The unpleasantness of this combatative nature of males dictated that we would no longer breed. This has led to another great sadness. The peahen has tried over a number of years to produce offspring. One Summer perched on the water tank she had to be hosed repeatedly to keep her alive in 40 degree Celsius heat. Like all good mothers she was willing to die for her young. The job of destroying her eggs either by removal or drilling holes was always unpleasant. But the sadness of the failed mother was really devastating. Someone who just wants the warmth of her own kind to raise and cannot achieve that position. Whenever she sees a chicken mother with a brood of little chicks she just stops and stares, a great sadness shows in her eyes. But the reality must be faced each year that they cannot survive in this area without protection and that protection can only be offered to a few. There was always this impression that there were mustard eaters and chilli eaters. This is no longer true. After many years of weeping eyes, running nose and burning mouth our mustard eater has acclimatised to chillies while still enjoying mustard. The pain and half eaten meals have been worth it. What a wonder of nature! During the year our many chilli plants produce copious amounts of fruit. One bush has larger mild chillies ,while the other has small very hot little babies. 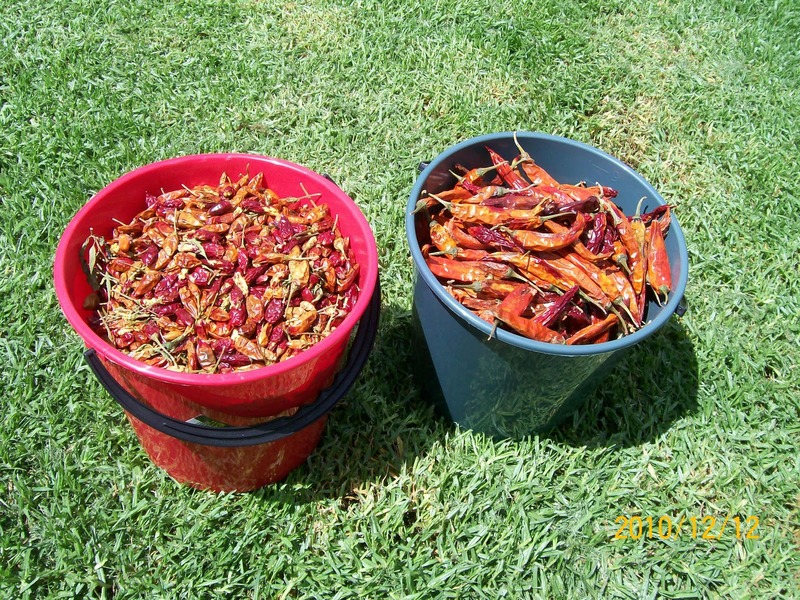 Most of the time we will use the fresh chillies to spice up a dish but from time to time the bushes are bare and we keep a reservoir of dried chopped fruit. Putting together a store of dried chopped chillies is quite easy. When in its peak the chilli bush is covered in fruit. Once every week or so it’s easy to spend a few minutes collecting a small quantity and laying them out to dry on racks. We are fortunate to have some retired pasta drying racks. This is merely a set of wood frames with some flyscreen as a base. To protect the mesh we lay down a few sheets of newspaper. 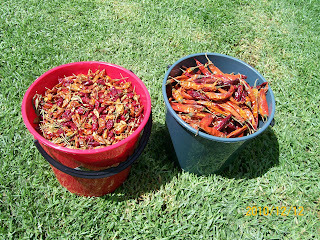 Gradually over a period of months a good supply of dried chillies is built up. The processing step again is simple, although care should be taken to not get the dust into eyes. We use a food processor with the blender attachment to coarsely chop the fruit. After processing the material is warm. To ensure it is completely dried the lid of the container is left off for a couple of days.